If you're into disemboweling your opponents in various, creatively gruesome ways, while splashing their blood up and down the walls of the map you happen to be playing, Torn Banner's Mirage: Arcane Warfare may indeed be the game for you. The game has had a 12-minute trailer/gameplay action video released the other day at the Pax West convention in Seattle, looking to offer an insight into the alpha build of a title which is set to fill several shoes apparently. From the said footage, one gets the impression that Torn Banner are revisiting their Chivalry IP, diluting it with a touch of magic to try to turn it into a sort of medieval-themed Overwatch. Mirage is essentially a multiplayer FPS, which is based on skill and allows players to use a combination of magic and melee to destroy their opponents. The game features no fewer than six different classes, starting with the stealthy assassin and wrapping up with massive brutes and powerful mages. The game is reportedly focused on making players feel truly in control of their weapons and magic abilities. 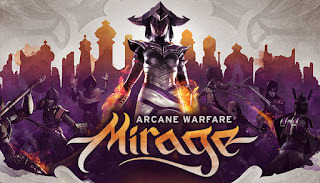 As far as the trailer is concerned, Mirage: Arcane Warfare isn't particularly impressive from a graphical point of view, in its current state. The animations are chunky and the various fatalities which occur every step of the way, lean towards the ridiculous rather than the impressive. Obviously though, we need to bear in mind that what we're seeing is but the alpha version of a game that may yet grow to be impressive in every way. The environment already looks more than decent, with its own personality and cartoon-like charm. It is also easy on the eyes in terms of opponent-spotting. The alpha testing of Mirage: Arcane Warfare is set to kick off sometime in September and registrations are already accepted at the official site of the game. If you prefer to annihilate your opponents in less gruesome ways, then consider putting your skills to the test and play live dealer casino games instead. Philip Thalberg has been covering Overwatch events for GGnet since the launch of the game.